Ohio Court Issues Orders Protecting Ms. Edwards' Intellectual Property. 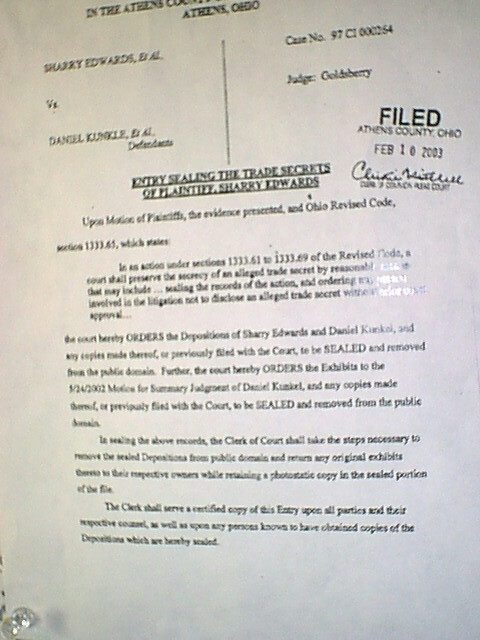 On February 10, 2003 the Athens County Ohio Court of Common Pleas issued an Order sealing and removing from the public domain deposition documents containing her intellectual property and trade secrets that were filed in an action that had been pending since 1997. Among other issues, this case tested Ms. Edwards' status as the originator of Human BioAcoustics. Ms. Edwards, a recipient of the prestigious O. Spurgeon English Humanitarian Award in 2002, stated that she was "gratified over the ultimate support for Intellectual Property shown by Judge Goldsberry and the Ohio legal system." Ms. Edwards was accompanied in Court by her husband, Bill Edwards and two members of her legal team -- lead attorney on the case, George Wolfe, JD. SHRI trustee, Ralph Fucetola, JD also consulted in the protection of Ms. Edwards' trade secrets. 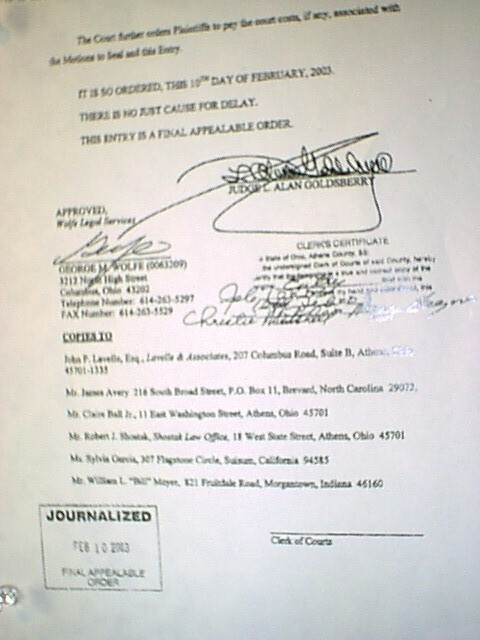 For an update, with the March 18, 2003 Order upholding the original Seal Order, please click Here. Links to a copy of the February Seal Order are below. For a copy of a letter posted by Ralph Fucetola JD regarding issues in the underlying case, please click Here. Bill and Sharry Edwards, with Counsel Wolfe on the steps of the County Court House, with the Seal Order.